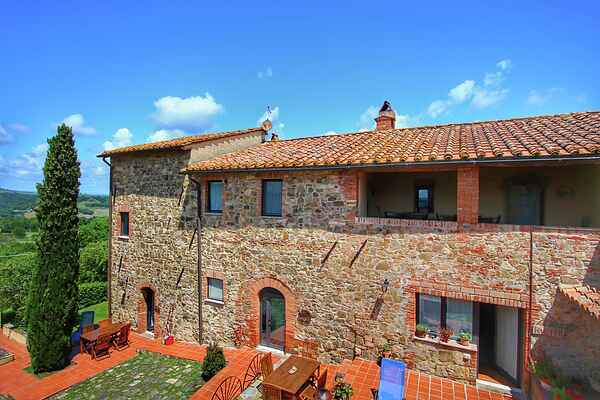 This wonderful holiday home is situated in an estate in Tuscany, in the middle of what may be the most famous valley of Tuscany, the Val d'Orcia. You'll reach the entrance of your holiday home via the stairs from the patio with loggia, which is shared with the guests in the adjacent accommodation. You'll notice the Tuscan atmosphere as soon as you get in. Characteristic elements such as the terracotta flooring, wooden ceiling beams and attractive furniture all add to the Tuscan feeling. The house is surrounded by outdoor space where you can enjoy the sun. The swimming pool is a perfect place to cool down, but also to enjoy the splendid scenery of the Val d'Orcia, which is listed as a World Heritage Site for good reason. There is something to do for everyone! You can take beautiful walks in the lovely countryside or go mountain biking and for children there's a small playground on the estate. A football pitch, volleyball field and basketball court are all available, but you might just prefer to enjoy the tranquility and the magnificent landscape of this estate. Medieval Tuscan towns such as Pienza, Buonconvento or San Quirico are easy to reach from the estate and the famous wine towns of Montalcino and Montepulciano are also around the corner.